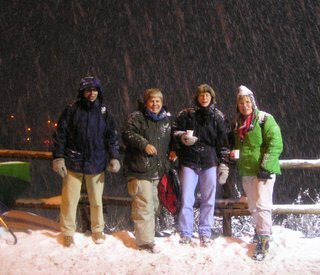 Sicilian Odyssey: Winter Olympics a Bit Too Wintry! My trip to Torino to the 2006 Winter Olympics had its highs and lows. Seeing the USA men's hockey team play Slovakia and hob-nobbing with athletes along with their families and friends were the highlights, for sure. Lowlights were missing two events for which we had tickets--freestyle women's aerial skiing and men's curling. Not only was this Olympic hockey, but it was my first live hockey match ever! And I liked it a lot more than I expected. Thanks to my knowledgeable traveling companions, all PE teachers, I was able to learn about the game and follow it fairly easily. I can say it's much, much easier to see the puck in real life than on television. 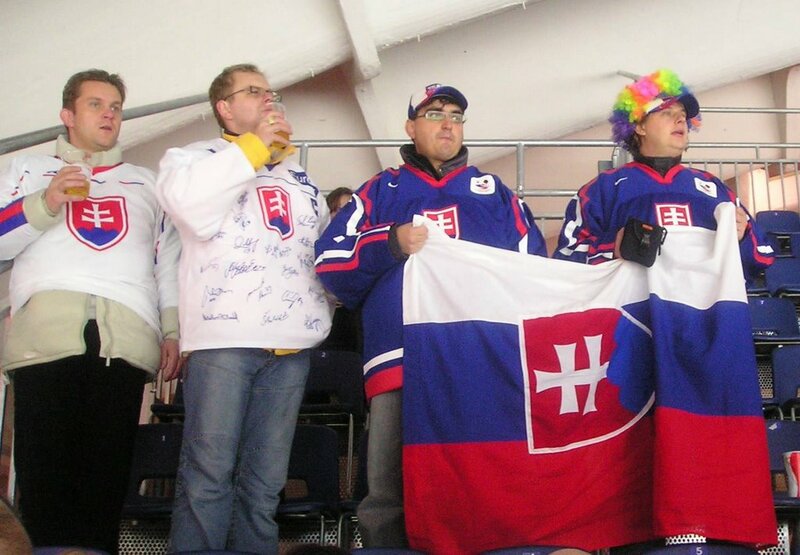 It was kind of surprising to see the US outnumbered by Slovakian hockey fans. Or maybe that was just because we seemed to be in the midst of them? Both countries had red, white, and blue national colors, which made for a colorful display of fanware. Flags, crazy hats, face-painting, and scarves were all over the place. Being well-trained in terrorism, we four, of course, did not exhibit a single thing to identify us as Americans. Unfortunately, the US lost the match, 3-2. 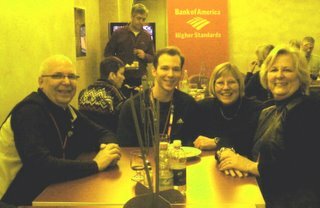 Thanks to my traveling companions making contact with former friends from Heidelberg, Dave and Jan Merhar, we found ourselves as special guests inside the Bank of America hospitality house for Olympics athletes, families, and friends. Dave, who knows everyone, arranged this and we were all thrilled at this opportunity. We had to produce passports, go through security, and have special photo ID passes issued to us each day before entering. Inside, we found free buffets of food, open bar, big-screen televisions, press conferences, athletes, families, and friends. Wow! We were visiting with Dave and Jan when an older couple joined our table. They were the parents of Olympic ice dancer Ryan O'Meara, we soon found out, the youngest on his team, and they told us all about his road to the Olympics. They certainly were the proud and happy parents, as they should be. A little later, Ryan himself showed up, had lunch at our table and graciously answered questions and posed for a photo. Later on, I saw the women's ice hockey team and former Olympian Nancy Kerrigan. Getting to the freestyle ski event was just about an all-day venture. We had to drive into Torino from our hotel, find parking, buy train tickets, eat lunch, ride the train an hour to the mountain town of Sauze d'Ouix (practically in France) and then take a shuttle bus to the event venue way up the mountain and arrive at the recommended two hours before the event, which was supposed to start at 18:30. It had been raining in the morning and turned to snow in the afternoon. By the time we reached Ouix, it was really snowing hard and accumulating quickly. The shuttle buses were there and took us up the zig-zag two- lane road to the drop-off point for events. Up there, it was snowing even more and visibility was limited. Plus, it was now dark. We found out soon that the event was postponed till 20:00 and not looking favorable for that time, either. Halfheartedly, we walked part way to the venue, stopped for hot spiced wine, and then decided to give it up and head back to the shuttle area. About then, we heard that it was, indeed, cancelled for that day. Unfortunately, so did hundreds of other spectators, and everyone wanted on those shuttle buses down the mountain. Even more unfortunately, traffic on the road, including the shuttle buses, pretty much just stopped. We felt fortunate to get on one of the few buses that made it to the loading area, because we were getting pretty cold out there as drifts of snow formed on our heads and shoulders. Well, we got, started to melt, and the bus stopped dead in its tracks just a few yards from the pickup. The driver left the bus (this was not a good sign). To make a long story short, we ended up leaving the bus and slip-sliding on foot all the way down the stupid mountain to the train station (about an hour) and then catching a train back to Torino just in time to rescue Vera's car from the parking garage that closed at 1:00 AM. The day was not without a highlight, though. We traveled back on the train with the husband of Olympian bobsledder Jean Prahm, the partner of Vonetta Flowers, the famous first black medal winner in a Winter Olympics. A very unassuming, nice young man from Iowa, he told us stories of her life and training for the Olympics as well as the unsatisfactory conditions of the Torino Olympic Village. Apparently, there wasn't enough room, the place smelled bad, and the construction was shoddy. Many of the mountain-event athletes were staying instead in hotels near their events. Dave got us unexpected tickets to a men's curling event on our last day, Monday, but unfortunately, my plane ticket made it impossible for me to stay and see it. I took a train and bus to the Bergamo and airport and flew directly back to Sicily, arriving at about 20:00 in now unnecessary snow boots and down jacket. Hi there. It was nice to meet you and your friends that day on the train. You have a very nice blog here. Oh, and thanks for the kind words.